Keep up with your daily schedule in style and create your own personalized calendar. MyPix2 offers different calendar sizes and templates so you can show off your photos in a unique way and keep up with your upcoming celebrations, events, appointments and more. Perfect for your home, workspace at the office or even a school locker, we have a calendar that’s perfect for your schedule keeping needs. Customize yours today with your favorite photos to brighten you daily routine! The quintessential calendar, our spiral bound wall calendar measures 8.5×11 and can be hung virtually anywhere. Hang one by your home phone to quickly write down any appointments or keep one by your desk at work to view upcoming meetings and business appointments. Not only practical, our custom folding wall calendar can be printed with your most cherished memories so you can feature a new photo each month to liven up your surroundings. Choose from a variety of background templates and collage layouts to display your best wedding moments, vacation pictures, kids’ photos and more. Our spiral photo calendar can also be customized by using our text feature to print appointments, birthdays and anniversaries on various days for each month. There’s no better way to keep up with each day than reliving your most cherished memories. If you’re looking for a classic poster calendar, MyPix2 has you covered. Our 12×18 calendar can be designed with a photo collage of your favorite photos. Upload your favorite snapshots, school pictures, graduation photos and so much more to transform your photo poster calendar into a piece of colorful wall art. Each 12×18 calendar displays every month of the year in one spot so you can easily keep the days of the week in full view to plan upcoming events, gatherings or business engagements. Our single page photo calendar measures 8×10, making it ideal for hanging on any wall, cubicle or locker. Post it anywhere at home, work or school and keep track of each day, week and month while keeping your favorite memories close. 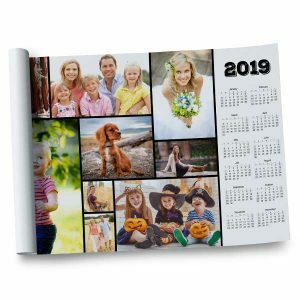 Our 8×10 page calendar is available in both portrait and landscape orientations with a variety of single photo or collage photo templates so you can make your calendar just the way you want it. Tack it up and plan each day while reminiscing about your most treasured moments throughout the upcoming year. Whether it’s Dad’s upcoming birthday or you want to simply find a fun gift for a favorite coworker, our personalized photo calendars are sure to please. Just upload some photos to MyPix2 and design a fun gift that everyone on your shopping list will love. 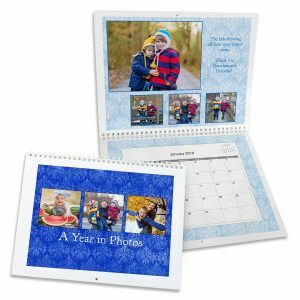 Not only practical for schedule planning, our photo calendars make a great gift that showcases a friend or loved one’s favorite photos in a unique way. For Dad’s birthday, surprise him with a custom wall calendar that displays his favorite photos. We have a variety of customized options that will allow you to create the perfect calendar and you can even add text to individual days for family birthdays and anniversaries. 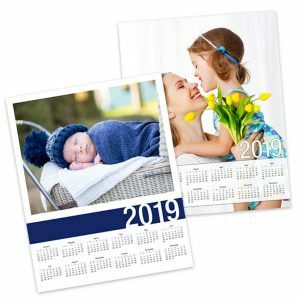 Design each month of his calendar with a different variety of photos including wedding pictures, camping trip photos, fun family portraits and more. He’ll love keeping it by his workshop table at home or his desk at the office. Speaking of the office, our photo calendars make a great gift idea for coworkers and even your boss. Create a photo poster calendar with your favorite office photos and give it to your coworkers, boss or team for an office gift that will be well received. No matter the occasion, everyone will love a custom designed calendar for its stylish photo display and practicality. Just pick out some photos and let your creativity flow for a great gift that’s sure to impress. Photo calendars are a great way to showcase all of your favorite memories. For your wedding anniversary month, why not create a collage of your best wedding photos to celebrate the occasion all month long. Maybe you’d like to add your favorite summer cookout photos to your summer month displays or upload your best holiday family photo for December. 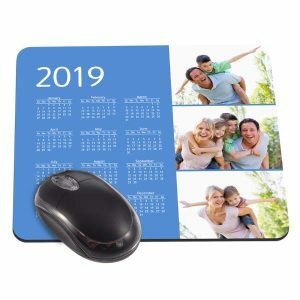 No matter the memory, it will look stunning as part of your custom calendar design and you can relive your favorite moments each time you view your schedule. Whether you want to hang a wall calendar by your phone in the kitchen or put one beside your desk at work, we have a variety of calendar options just for you. 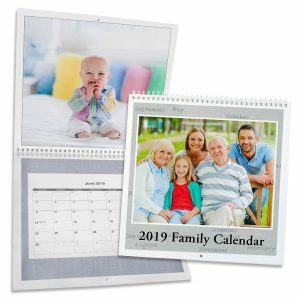 Easily create a calendar with your favorite photos and display your memories in a unique way while planning upcoming anniversaries, business meetings and more. Our customized calendars are a great way to keep your schedule straight or make an ideal gift for anyone on your shopping list. With so many possibilities, you can’t go wrong. Upload your most cherished memories to MyPix2 and create the ultimate calendar you can enjoy the whole year through!